I didn't really think I'd keep it up. Not sure why, but...well, I am surprised. First I want to thank everyone who came, even if you only stopped by once. I sure hope a few of you will become regular visitors, and I hope I can always keep improving my blog. More than a few of us are doing what we learned, and I think it's the most appropriate finishing post for the month. I learned that I could blog every day. Sounds simplistic, but as I said, I think I doubted myself. I learned I like writing every day. Some days freelance writing can get too...well, let's say some days I find myself far too easily distracted. I let everything else take the priority list. Writing is good for me. It's good for my soul, even if no one reads the particular post I make that day. And the blog is more of a creative outlet than anything else in my world right now, and for that I am grateful. I learned that the more I blogged, the more ideas I had to blog about. As with all things, the ideas are all around us. It just takes us to pause a moment in this whirlwind called life and notice those ideas. I especially learned of a few new blogs that I intend to visit regularly. No names now, but in days to come, I'll definitely be mentioning them one place or another. They are too good not to share with the world. I hope I find myself--now that I don't feel I MUST post--taking time to write more essays here...food inspired or not. That's writing I love to read, and that's writing I would love to write. I learned that most bloggers are incredibly giving of their time--I asked a group of food writers if they would answer a few questions for my Thursday posts, and I was overwhelmed with the contributions my fellow writers, writers I consider friends even if we've never met, made to Babette Feasts just by answering those questions. Thanks again, everyone for visiting day after day. I appreciate you all. It's been fun spending time with you each day, Barb! I find that blogging opens my eyes up to all the interesting things in my life that I'd never noticed before! Sounds like I missed something I would be interested in. If there's a mailing list for the next one, please add me. Meantime, I'll look forward to your future posts. Hey, foodalogue, thanks for visiting...Michelle Rafter of Word Count (http://michellerafter.com/) organized the blogathon. More than 100 of us (I think) aimed to blog every day in May...I have a strong feeling she will repeat the effort next May...This was the third time she rallied bloggers to do this.. Thanks for stopping by and I hope you come often. 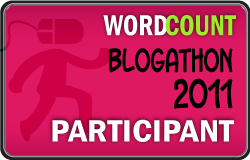 Barb, congratulations on completing the Blogathon! I love #3 on your list. I was worried I wouldn't have enough ideas to fill 31 straight days, but they really started to flow for me when I took the time to look at everything food-related around me. I was also surprised (and excited) by how giving everyone was to answer interview questions, comment, etc. I love reading food essays, so I'm looking forward to seeing yours here soon! It was strange to wander around on the internet today...and not blog. You're right about ideas. I probably could have blogged a few posts today! Barb, I had no doubt you'd reach the finish line. Your blog helped make this month-long event more fun. I love coming here. I was thoroughly satiated by your artsy photos, delicious recipes and funny stories. A great reflection on lessons learned, and on writing in general. Thanks.